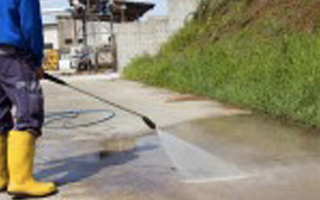 Our HOT water power washing equipment has variable pressure up to 4000 psi and 6 gallons per minute of water for general building cleaning including parking lot cleaning and graffiti removal. Getting ready to repaint or reface your building? Get it cleaned by professionals and remove peeling paint, cobwebs or black film. Clean Up for Your Grand Opening! At Shopping Centers, Office Buildings, Parking Garages, Restaurants, Warehouses, Manufacturing Facilities, etc…. Asphalt Doctors cleans your sidewalks, parking spots, patios awnings, dumpster areas, windows including many specialty items. Make your equipment look like new with a thorough exterior detailing, which includes engine compartment, radiator, windows, tires and rims. Pressure Washing your equipment in preparation for sale, transport or rental will improve the value of the equipment. Asphalt Doctors cleans tar, asphalt, concrete dust and dirt from your equipment including the pivot points, pins, and articulating points. We remove excess grease, muck, dirt build up and mud from all types of heavy equipment.